Broken bones (also called fractures) in the foot are very common. In fact, about 1 out of every 10 broken bones occurs in the foot. Here's why. Divide the foot into 3 parts: the hindfoot, the midfoot, and the forefoot. There are 2 bones in the hindfoot. These are the talus, which is where the foot attaches to the leg, and the calcaneus, which forms the heel. Five smaller bones called the navicular, cuboid, and 3 cuneiforms make up the midfoot. The long part of the foot is called the forefoot and contains 19 bones. There is a metatarsal for each of the 5 toes, the big toe is made up of 2 phalanges, and the other toes each have 3 phalanges. In addition, the foot sometimes has some small pebble-like bones called sesamoid bones. These bones do not perform any necessary function and are often called accessory bones. In adults, bones are stronger than ligaments (which connect bones to other bones) and tendons (which connect bones to muscles). But in children, ligaments and tendons are relatively stronger than bone or cartilage. As a result, injuries that may only cause a sprain in an adult may cause a broken bone in a child. However, a child's forefoot is generally flexible and very resilient to injuries of any kind. When metatarsal or phalangeal fractures do occur, they may be difficult to recognize, because many parts of a growing child's bone do not show up well on X-rays. For this reason, it is sometimes helpful to get X-rays of the child's other, uninjured foot to compare to the hurt foot. Broken bones in the foot cause pain and swelling. Usually (but not always) the pain is so bad, that you are not able to walk. Broken bones in the toes cause less pain, and you may be able to walk with a broken toe. Bruising of the foot with a broken bone is also common. Sprains can also cause bad pain, swelling, and bruising, so it is usually not possible to tell if a foot is broken or sprained just by looking at it. Here's what to do when examining an injured foot for a possible broken bone. Take the shoes and socks off both feet and compare them side by side to figure out how much swelling is present in the injured foot. Look for any large cuts or wounds. Large cuts or wounds that expose a broken bone are more serious. It is important to see a doctor any time you think you may have broken a bone in your foot. For less severe injuries, your doctor may want to see you in the office or may choose to have you go to the emergency department. If you think you have broken your foot, and you can’t reach your doctor right away, it is reasonable to go to the emergency department to be examined. Call 911, if needed, for transport to the emergency department. Do not attempt to drive with a broken foot. The foot is blue, cold, or numb. The foot is misshapen, deformed, or pointing in the wrong direction. There is a large cut or wound near a possible broken bone. You feel you need immediate treatment for any other reason. First aid for people with foot injuries is stabilization and elevation of the injured foot. Any splint that keeps the injured foot from moving is effective. Often a pillow wrapped around the foot like a stirrup and then taped or tied with an elastic bandage works well. Do not wrap the foot so tightly that it cuts off the blood supply to the foot. Any splint that causes the foot to hurt worse, turn blue, or makes it more difficult to wiggle the toes, should be removed right away. Elevation of the injured foot reduces swelling and pain. Proper elevation requires the foot to be at a level higher than the rest of the body. Lie flat with the foot propped up on several pillows. Ice wrapped in a small towel and applied to the injured foot may also reduce swelling and pain for the first several hours after an injury. Do not attempt to walk on an injured foot if walking is painful. Injured toes usually heal well even if they are broken. They can usually be treated at home unless the toe seems to be very deformed or pointing in the wrong direction. Treatment involves splinting the injured toe to the good toe next to it. This is called "buddy taping." Place some padding (usually cotton balls) between the injured and good toe and tape them securely with a wide medical tape. They should be secure enough to provide support but not so tight as to cut off blood supply to the toes. A shoe with a fairly rigid sole like a wooden sandal, a clog, or a rigid flat-bottom shoe from a medical supply store is also helpful. Treatment for a broken bone in the foot depends on which bone is broken and how it is broken. Some broken bones in the foot can be treated with crutches and flat-bottom shoes, others require splints or casts, and still others require surgery to repair the bones. Crutches are used to help you walk when you have a hurt foot. When walking using crutches it is important that they fit right and that you use them correctly. Your doctor should adjust your crutches to fit you and show you how to use them. When using crutches, it is important to put your weight on your arms and hands. Do not put your weight on your underarms (armpits). This could hurt the nerves that are in your underarms. Your doctor will tell you whether or not you should bear any weight on your injured foot. 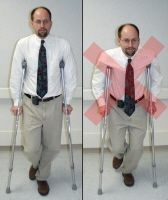 To use crutches in a "non-weight bearing" way, you should keep the knee of your injured leg bent whenever you walk, to keep the injured foot from ever touching the ground. Do not let it touch even to help with balance. To use crutches for "partial weight bearing" or "weight bearing as tolerated," you can let your injured foot touch the ground only when the crutches are also touching the ground, so that some of your weight is on your foot and some is on the crutches. Always let your injured leg swing with the crutches. If it hurts when you walk, put more weight on the crutches and less on your injured foot. Follow-up with your doctor or orthopedist often is needed to make sure that foot fractures are healing well. Follow-up is particularly important if pain continues or if you have difficulty walking. It is always better to prevent broken bones than to treat them. Toe fractures are common and generally heal well with little or no therapy. Although the bones may take 3-8 weeks to heal, pain usually improves much earlier. Rarely, very severe fractures, especially of the big toe, may require a cast or surgery. Metatarsal fractures usually heal well. The first metatarsal (the one attached to the big toe) sometimes requires a cast or surgery and a prolonged period on crutches, but the middle 3 metatarsals can usually be treated with a rigid flat-bottom shoe and partial weight bearing. "March fracture" is a metatarsal stress fracture that commonly occurs in joggers and requires stopping jogging for 4-6 weeks. The fifth metatarsal (the one attached to the pinkie toe) is the most commonly broken bone in the midfoot. There are 2 general types. One type is the proximal avulsion fracture. These are very common and usually happen at the same time as a sprained ankle. They heal very well with a rigid flat-bottom shoe or elastic bandage and weight bearing as tolerated. The other type is the Jones fracture, which is much less common but does not heal as well. This fracture gets worse with time if you keep walking on it, so non-weight bearing is very important. People with this fracture are more likely to develop problems healing that require an operation. Fractures at the joint between the cuneiforms and the metatarsals are called Lisfranc fractures. These are rare, but can be difficult to diagnose and treat. Weight-bearing X-rays (taken while standing on the injured foot) are sometimes needed to look for this problem. These fractures sometimes require surgery. Navicular fractures are rare and most often represent stress fractures in young athletes. They usually heal well with a rigid flat-bottom shoe and weight bearing as tolerated. Severe fractures through navicular bone sometimes require surgery. Calcaneal fractures often occur in people who fall from a height and land on their feet. These people often have other injuries as well, so they should be examined carefully. The most common fracture of the calcaneus, the intraarticular joint depression fracture, usually requires surgery. Other fractures of the calcaneus can usually be treated with splints or casts and non-weight bearing. There are many types of Talar fractures, some of which are difficult to diagnose and treat. Lateral process fractures often occur from snowboarding injuries. Posterior process (Shepherd) fractures are found in athletes who dance or kick. The diagnosis of these injuries often cannot be made in the doctor's office or emergency department on the initial visit and require bone scans or other studies if symptoms continue. Treatments vary but often require splints or casts and a period of non-weight bearing. Media file 1: Broken foot. Proper use of crutches is shown on the left. Crutch tips are shoulder width apart. Elbows are straight and locked. Pads at the top of the crutches are 3 fingerbreadths below the armpit and press against the side of the chest. Incorrect use of crutches is shown on the right. Media file 2: Broken foot. Proper use of crutches for non-weight bearing. The knee on the injured leg is bent to keep the injured foot off the ground. 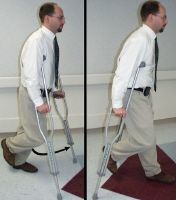 Crutch tips are placed in front of you as you walk, and the good leg swings forward between the crutches as shown.